I think that I can confidently say that anyone reading this post has an intimate relationship with Google. After all, it’s one of the most important companies in the world and has helped to spearhead the Internet revolution — which is up there with invention of the wheel, the discovery of electricity, and the creation of all-you-can-eat buffets. One of the biggest indicators of its dominance is that — like Kleenex, Band-Aids, and Scotch Tape — the Google brand name is used interchangeably with its category. Don’t believe me? Just Google it. 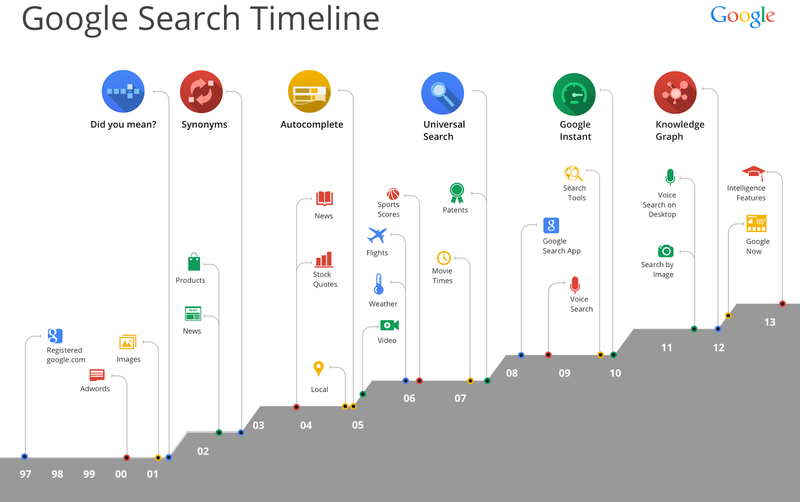 Google Search recently released a timeline of its history. Some of these milestones are features that many people use every day, and you might have assumed that these features have always been around. However, for those of us that were learning to crawl, walk, and run the Web along with Google, these enhancements were groundbreaking functionality that truly made using the Internet much more powerful than ever before. Having taken this journey myself, I thought it would be an interesting exercise to go through their infographic and pull out what I consider are Google’s top seven milestones. I used the Internet many years before Google. In the Dial-Up Era, there were literally hundreds of search engines, and they pretty much all were terrible. No matter what you searched on, you either got adult pictorials or classified ad listings. Google became Google simply because its technology actually worked. Google’s story is the textbook America dream. It was started in a garage by two super smart kids with an idea and almost no money. If you haven’t read Larry and Sergey’s original Stanford thesis (aren’t we all on a first name basis with them at this point? ), The Anatomy of a Large-Scale Hypertextual Web Search Engine, you should give it a read. For search engine marketers, this is one of the most important documents in your industry’s short, yet rich history. Google kicked off the new millennium Internet Era as the largest search engine in the world. In just three short years, Google had indexed over one billion Web documents; it would reach three billion less than two years after, and 1 trillion unique URLs were indexed by 2008. I remember what most impressed me at the time (and this seems a bit silly now) was that you could always see the number of total of results at the top of the page along with how long it took for Google to return those results to you. It was usually millions of pages of Web content that was searched through within a second. At this point, it’s not a big deal — but at the time, it seemed so advanced and made them look really, really smart. Searching through the billions of images published online is truly one of the most valuable things Google Search offers after its Web page crawler. I certainly use Google Image Search every week. To have so many photos, graphics, and cartoons at your fingertips in seconds is useful in so many ways. Not only can you use them for practical methods such as embedding a snarky illustration or stock photo into your PowerPoint presentations; but, you can also use Google Image Search to help find relevant Web pages when you can’t find what you’re looking for via the core search function. Wow, Gmail. It almost feels like it’s been around forever. Unlike some of the other categories that Google has owned from the very beginning, email was a fairly mature Internet category before Google arrived, with Hotmail, Yahoo Mail, and AOL dominating the space. Gmail launched out of the box offering the equivalent of 500,000 email documents — and I remember that I switched to the service immediately just because I was running out of space from my other provider. Almost a decade later, that Gmail account is still my primary online contact address, and I have folders with important emails from years ago. This is also a milestone because it demonstrated Google’s ability to enter a new space and become one of the leaders in a very short time. Marissa Mayer, then VP of Search Products & User Experience at Google, described Universal Search as “one of the biggest architectural, ranking, and interface challenges we would face at Google.” This was the first step in changing the Google Search Engine Results Page (SERP) into the rich search experience that it has become today. Instead of just showing links to Web pages, Universal Search brought in images, news stories, videos, etc. That made the SERP a much more valuable starting point on the Web than it had been before. For months leading up to the release, Google experimented with this program, and screenshots were shared throughout the community as we imagined what they were working on and how it would affect our search marketing efforts. Consumers easily embraced the change, but the impact on advertisers was felt more immediately — both for paid and organic search marketers — as this new content pushed listings down the page. As you typed your query, Google Suggest would try to figure out what you were searching on and display those probably-final queries in a drop-down menu. Not only would this make searching faster, but you could also get help figuring out what you should actually type. In 2010, Google Suggest evolved into Google Instant, which actually begins to load the results from the top suggested query while you type. Why is this valuable? The user benefits of Google Instant are many — but the primary one is time saved. Our testing has shown that Google Instant saves the average searcher two to five seconds per search. That may not seem like a lot at first, but it adds up. With Google Instant, we estimate that we’ll save our users 11 hours with each passing second! Eleven hours saved per second! Not bad…. I’m all about metadata, and I feel strongly that Google Search Options has been one of the most underrated features of Google Search in the last ten years. In fact, I would imagine that most Google users rarely even utilize the options available. I can’t imagine not being able to have these options when searching! It would be a nightmare. Well, Google… happy birthday, 15 already. Wowsers. Is it me, or do you feel much, much older than that? You can’t even drive in this country and you’re already one of the biggest companies in the world! Talk about a child prodigy!